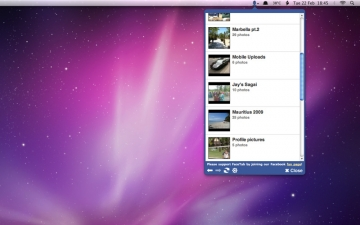 [無料] MenuTab for Facebook | Mac App Storeのアプリ検索・ランキング BuzzMac! MenuTab takes your Facebook addiction to a whole new level. 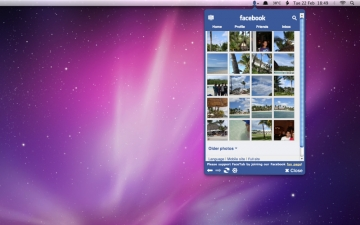 It is the best app for instantly accessing your Facebook account without having to open your web browser! With MenuTab, we take advantage of the magic of Facebook to make everything totally real-time, with the latest news from your friends coming straight onto your desktop. MenuTab is absolutely free and allows you to view and control your News Feed, Profile page, Inbox, Photo albums, Groups, Pages, Events, Notifications and so much more! MenuTab now even supports Poking and Tagging photos, amongst existing features such as updating your status and the 'Like' button! Downloading this should be a total no brainer! 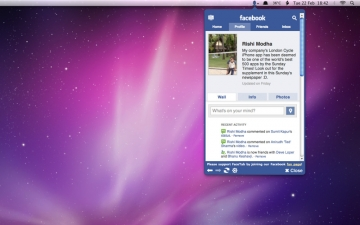 After installing, simply click on the MenuTab icon in the top menu bar whenever you want to check your Facebook account. 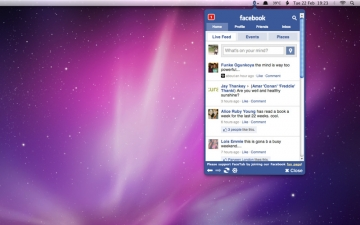 From there, you will be presented with a beautiful little window that contains the brilliant Facebook Touch interface. Open the Preferences menu to configure settings such as refresh rate, audio alerts and more. - MenuTab is a 3rd party application for Facebook and is in no way endorsed or affiliated with Facebook Inc.
- Facebook and the Facebook Logo are trademarks of Facebook Inc.